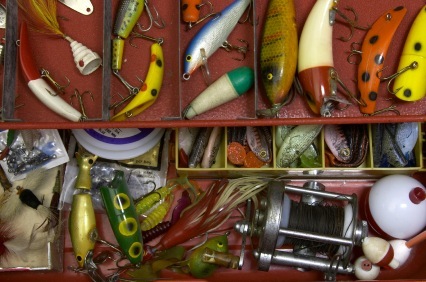 What are the basic items you need to have in a tackle box? It depends on what your fishing for, but I have a wonderful must-have list for you to use. To answer that question - it depends on what you are targeting to catch. I am going to give you basics though that everyone should have on hand when fishing. Outfitting your first one really is fun to put together and will become something that you will be proud of that lasts for decades (and if your like us, will have thousands of dollars invested in it also). Let's start with the actual tackle box. It should be strong. A top opening box with a attached tray is a great one for starters. Purchase a plastic one because they are tough and waterproof, two things that are a must when fishing. Next are hooks, line and sinkers. With hooks, the large the number the smaller the hook. Hook sizes 6, 8 and 10 are great basic hooks when fishing for trout and panfish. When you are after larger fish like walleye and northern pike, purchase hook size 2, 1 and 1/0. You will also want to have some circle hooks on hand, because they hook the fish in the mouth so your not jerking the line when you set the hook. When you buy fishing line, to stock your tackle box, look for the line that goes with your reel. If you can't use it on your reel, it's just a waste of money; so buy a extra spool or two. If you do not know how to tie a fishing knot, I'll give you the basic knots that are used and others that are fun to know. To sink your fishing line below the water, you'll need small weights called split-shot sinkers. There is a slit down the center and this allows you to pinch it onto the fishing line. Some split-shot sinkers are made of lead; DO NOT BUY THESE. Never put a lead sinker in your mouth. Choose sinkers made of steel, tin or other non-toxic materials. Next are bobbers. They are usually made of plastic or foam and the bobber keeps your lure or live bait at a certain depth. When a fish nibbles, it "bobs" up and down on the water and you definitely set the hook when it disappears in the water. A fixed bobber is simple to put on and take off your line. A slip bobber is much easier to cast. Choose different sized bobbers to match the weight of your bait. Following are my suggestions of lures you should have in your tackle box. Why? Because they work! Make sure you choose the size depending on the fish you are targeting. If you are fishing pike, buy a huge northern pike lure; a huge waste of money if you will never fish for pike. Jigs actually look like bugs, insects, live bait, small fish, or any other natural food that fish feed on. A jig has a weighted head and a hook attached, so you do not need to use a spit-shot sinker. Many have tail feathers, hair or soft plastic and can jigs work for any fish that you want to catch. Plastic worms are make with or without scent to attract a fish. Try different colors and sizes when fishing for bass, panfish and walleye. Spinners have one or more "blades" that spin around a metal shaft. You usually find them with soft tails of soft plastic or animal hair. These are great for trout, bass or northern pike because they will see the flash from the spinning blades and feel the vibration it makes when you are reeling it in. Diving lures or "crank-baits" imitate minnows, and the lips of the lure make them dive and wiggle - luring the big predator fish like bass, walleye, muskie and pike. Surface lures or "poppers" float like frogs and insects. Try them out for any fish that you are targeting. Spoons have a large blade that wobbles like a minnow. Use these when fishing for trout, pike, walleye, bass and salmon. What else do you need for your tackle box? You will also want a small needle-nose pliers (we use a short and long hemostats), a small knife and a towel to wipe your hands off. We use kitchen flour sack towels and tie one to each seat in the boat. A pair of nail clippers to cut a snagged line or ends after you tie a knot and measuring tape is handy also. To change lures quickly it helps to bring along some swivels to tie to the end of the line. If you are cleaning fish where you are at, don't forget a fillet knife or large pocket knife, plastic bags and if it's hot out - ice in the cooler. The following items are MUST HAVE'S: fishing license and life vests for EACH person that cannot swim - on a boat and by the water. Having a current fishing regulation booklet is wise, unless you have memorized the minimum and maximum sizes of each species of fish you can catch - and the limit you can keep daily per person.